PEDIGREE & PROVENANCE--art words and terms. The BENTLEY--travel for the art & antiques connoisseur. Editors note: We caught up with Matthew Nash in Manhattan in September of 1997 just before Nash departed for a stint in Juneau, Alaska as choreographer in residence at the University of Alaska. RB: When did you first become interested in dealing in and collecting antique clothing? NASH: It started when I was searching for vintage clothing to be used in my ballets. My interest was an outgrowth of looking for costumes. Dealing was just an accident. My first trade was with a dealer in New York: Darrow. A dress, I think it was. RB: How has your view of vintage clothing, or the world's view of it, changed since you started buying it? NASH: In the world view, vintage couture is now a much more popular subject; it is supported very aggressively by museum shows. When I was growing up, only teenagers and college students would wear vintage clothing--because it was eccentric. Now people wear it or collect it as art. RB: Whom do you prefer to deal with amateurs or experts---or just people who buy quickly--in cash? NASH: I prefer to deal with people who are buying something because they love it. I buy things because I love them. Every so often someone's eyes light up as mine did when I first bought it. RB: Of the clothing you have owned, what is your favorite? How did it come into your hands? NASH: I had a Folies Bergeres metal and rhinestone bikini--I'm not kidding--that was encrusted with jewels. I found it at the Metropolitan Antiques Center (in NYC)--in a furniture shop. It looked like French workmanship. It had to have been. I paid $250 for it and sold it for $2200. A more serious favorite, I bought at a show from a dealer who had just come into possession of an estate. He had brought in just a few items from the estate; they were not yet cleaned, nor marked. The dress was a Suzy Perette. It was so beautiful! It had a black top, long-sleeves with little cuffs, and a skirt of black, white & grey outsized checks---several layers. I called it "the country club dress"; it was the chic-est thing you could possibly wear to a country club dance. RB: What is your fantasy find? Where do you expect to come across it? NASH: It's an estate sale, before the estate is brought to auction. I walk into a closet that is filled with the standards: the Balenciagas, the Diors, the Mainbochers, early St.Laurent--but also Suzy Perette and LillyAnn, your modest stuff. All of this is in beautiful condition--where you know the woman loved her clothing and took care of it. The son, who is settling the estate, just wants to get rid of it all. RB: Have you ever sold anything and wished you had it back? NASH: One--for money--yes. I bought a dress at the first Doyle auction, (William Doyle Auction Galleries in Manhattan), I attended. This dress came under the category of the "ugliest garments in the world". It was so ugly that everyone in the auction room broke into laughter when I won it. It was a full length dress of felt; appliquéd on it were a patchwork quilt of sequins and paillettes and rhinestones. It was laughable--though clearly it was custom made. I took it to Darrow and she sneered. I asked that she keep it in the store for a month. I paid $40 and we sold it for $100. One day a black model came in and put it on, and she was an African princess. She bought it on the spot. RB: What is the smartest buy you ever made? NASH: The Folies Bergeres bikini. RB: What was the dumbest? NASH: There are so many, it's hard to choose. Probably, the dumbest is an early 70's Italian double-knit, slate-blue, long-sleeved collarless and two rows of military buttons down the front. It's hideous--not fun hideous--just dowdy. RB: Do you use reference materials in your field? Which one do you consider the most useful? NASH: I do use reference stuff. I often go back to my William Doyle auction catalogues. Also, I have books on the designers I'm most interested in: Dior, Balenciaga , Charles James--extraordinary. I depend on them. It's only out of curiosity that I look through them. It's not as though you can find prices in them, but in some books you can sometimes find the name of the owner. The books are good for general shapes--that sort of information. RB: Is there a trade event that you consider vital to attend? RB: What direction do you think collecting is going? What would you expect to be hot items five years from now? NASH: (Puzzled look) I think shoes are going to get more interest-- those from the 60's and 70's--although no specific names come to mind. RB: What do you think makes a great collector or a great collection? NASH: In my view--really a personal view--a great collection is put together by somebody who loves the objects. And the objects in it have to be of a certain class, but the collection could also include a day dress you buy at Bloomingdale's. A fine collection is put together by somebody who loves the garments. It becomes a reflection, not only of fashion history, but of the collector. RB: Where is your favorite antique clothing hunting location away from home? RB: Where do you like to eat and stay when you go there? NASH: With my Uncle George and Aunt Dottie. RB: When you consider buying an object, is there a mental checklist you go through in assessing whether or not you want it? What's on your list? NASH: Yes. Condition. Under that rubric is: mothholes, rotted silk, soilage. I ask myself: Do I like the piece? Also, I do have an eye out for whether I can resell it--so price is a factor. I usually won't buy a garment if it's not lined. It's just a little fetish. I won't buy anything sequined or decorated with pearls that is created with rows or appliqués--each has to be individually attached. RB: What should I have asked you, but didn't? NASH: There are questions in vintage clothing regarding such practical terms as size and wear-ability. We see vintage clothing used in various ways: Some people wear entire vintage outfits and look like they're going to a Halloween party. There are others who wear one item and mix it in with contemporary pieces. There is the museology aspect to vintage couture: is it an art or a craft? In what way do the couture items represent the culture of the time? When you go to a museum, how detailed are the explanations? How do the curators tell you what the designer is doing? How do they relate the garments to their times? Curators never answer these questions. There are questions of care: Are these lovely garments things to be kept under glass or are they things to be worn? To me, wearing a Charles James ball gown on the street--that would be sacrilege. The whole museology thing makes me crazy. At the Dior show, (Metropolitan Museum of Art, NYC--1996), the curators gave the standard line: "The New Look" came about as a backlash to the austerity of the war years. But, in fact, Christian Dior's backer was Marcel Busack who was a textile maker. He had a great interest in promoting textiles. As luck would have it, "The New Look" took yards and yards and yards of fabric. Curators talk about Dior's innovations from one collection to another. Sure the collections were innovative. I want to know why. What were other designers of his time doing? What was the economic situation of the time? Who were Dior's junior designers and how did they influence him? In later years, St. Laurent was the junior designer who took over when Dior died; St. Laurent was twenty-two or twenty-three at the time. 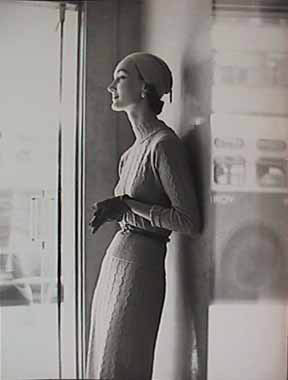 View Frances Pellegrini's original 1950's fashion photographs. BIDDINGTON'S Expert Consultancy interviews knowledgeable professionals and amateurs in the areas of fine arts and antiques collecting. COPYRIGHT: Images and information within www.biddingtons.com are Copyright Biddington's, Inc. 1997-2006--except where preceded by individual copyrights of the artists.